I finished the first draft of the still-unnamed novel about robots and runaways! There are some clever bits, but mostly it is rubbish. That is OKAY, because revision is a thing! I’ll give it a week or so, then I’ll start in on revision. I’m giving it a shorter turnaround than usual, because I seem to lose interest if I wait longer than that. I still can’t decide if the breakneck pacing genuinely works for me or not, but I’ll just keep trying new things until I find an approach that sticks. Oh, and if you’ve been following along with the video updates at all? I found a reason to use the DOGPILE scene. (I wasn’t gonna give it up without a fight.) It actually gave me some interesting material, but we’ll see how it plays out in revision. And now, I need sleep and literally anything to think about EXCEPT this damn book. 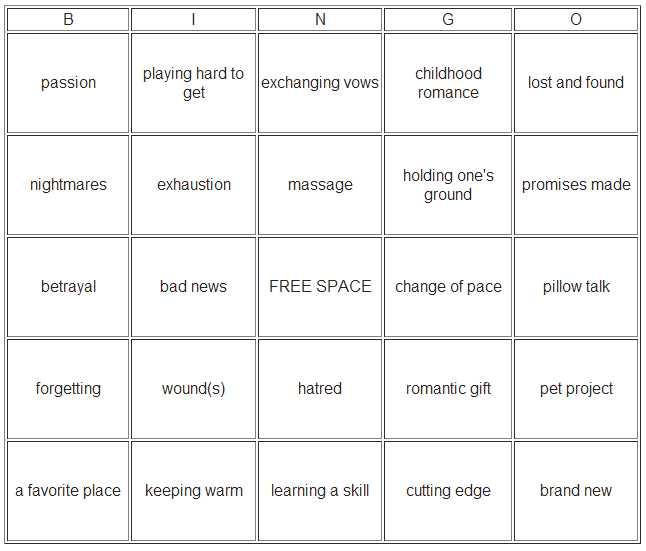 Prompts will be underlined as I fill them and linked to any stories made available. I know it’s early and no one has seen much of Team Hotel yet, but if you have a character you would love to see more of or a question about something that appeared in a previous story, let me know! I’ll keep it in mind as I write toward my prompts. …were the only things that had any hope of getting done, that’s what I’m doing. I keep running into walls, particularly with Incognito. Every time I do, I think, oh, well, I’ll work on something else for a while and let that one stew. Which is fine–I think the path of least resistance is an underrated option–but I got fed up with never finishing anything. So now I’m editing one of last year’s NaNoWriMo stories. This is a little bit of avoidance, changing projects again, but I like revisions and I have a better track record for slowly plugging away with them than I do with first drafts. Part of this is that I really, really want–NEED–to get something finished, edited, and self-published. I could really use even the most meager of income streams right now. Not just for the money itself, which I fully recognize is not going to be a life-altering amount any time soon. No, what I need is the psychological boost of accomplishing a goal and the sense of even a little security and self-sufficiency. I don’t have either at the moment. That’s where I am and why it’s been quiet here (along with being seriously ill for a couple weeks). At some point, I’d like to write about Anime Expo, which I went to at the start of July. For now, uh, I’m just really grateful that I’m getting something done each day. I’m having fun being really unkind to my characters. Since I’m skipping around and leaving out scenes, they’re not even getting the full force of it. I’m sketching out the whole plot, beginning to end, before filling in the missing parts. So right now, I’m going through the final clues leading up to the climactic scenes. Which means I’m at my most vicious. Friends are in danger, allies turn their backs, and not even home is a safe haven. I’m a mean, bad person and I LOVE it. The next part up will be the resolution, when the bad guys get their punishment. I don’t even have to feel bad about that part, so things are looking up. There’s just something about Nelly that I love. She’s a little bit Sherlock to Morgan’s Watson, even if Morgan is the detective. Nelly is brilliant and eccentric and loyal. She can also be off-putting and amoral and high-strung. She and Morgan have both made a point of carving out lives for themselves in a society that is not terribly kind or accepting of them, but Nelly is far more ostentatious. She wears her weirdness as a badge and a shield and one of those hand buzzers from a joke shop. She also gets all the best toys and who can resist that?